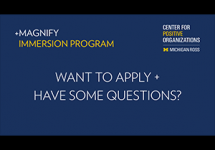 The Center for Positive Organizations is a community dedicated to positively energizing and transforming organizations and the people who lead them through Positive Organizational Scholarship. The study and perspective of Positive Organizational Scholarship is committed to revealing and nurturing the highest level of human potential, and it strives to answer questions like: What makes employees feel like they’re thriving? How can I bring my organization through difficult times stronger than before? What creates the positive energy a team needs to be successful? Positive Organizational Scholarship has become a major focus for organizations and empowers leaders to create positive work environments, improving the culture of their workplace and helping them discover what is possible with their employees and within their organizations. By bringing empathy, compassion, and energy into the workplace, leaders are able to enhance engagement and performance, and inspire their employees to innovate, find opportunity, and strive for excellence. Positive Organizational Scholarship principles create a generative business setting and act as a catalyst in the discovery of human potential. Positive Organizational Scholarship has become a viable sub-field in the area of Management and Organizations Studies, resulting in an immense amount of material available. The Center for Positive Organizations offers the following materials as a starting off point for the study of Positive Organizational Scholarship. David Drews: What inhibits optimized performance? David Drews: Does compassion belong in our hyper-competitive business world?